In Paris, there are about 16,500 taxis so you would think you could get one easily, no? Nope! Paris’ cabs usually don’t stop when hailed. Why? Because of the whole taxi organisation in Paris. I first published this article in 2012… Since then, taxis in Paris have changed quite a lot because of Uber, a web based taxi service. There were many anti Uber demonstrations in Paris in 2015 – and as a result the UberPOP service was forbidden, but NOT the regular Uber service. UberPOP allow a regular person with a car to register on UberPOP and offer rides occasionally. This is forbidden in France. The regular Uber taxi service is perfectly legit in Paris as well as in the rest of France. And there are Uber cabs at about every corners in Paris. I am myself an Uber customer, and love it! Uber broke what was a real monopoly in Paris, forcing the other Parisian taxis to be more polite, on time, and overall much more reliable. 3 – How to Get a Taxi in Paris? So, when you want to get a taxi, your first move should be to look for a taxi stand: they are around, all 740 of them, so you should always ask your hotel “Où se trouve la station de taxi la plus proche?” (Where is the nearest taxi stand?). Taxi stands in Paris are signaled by a blue square sign on which is written “taxis” and some have some sort of a phone. Some have a phone you can use to call another nearby station: if there is an available cab there, the driver may pick up the phone and come pick you up at the station you are calling from. You can also try calling 01 45 30 30 30: you will then have to select your “arrondissement” and closest station. Then the phone of the station will ring, and you may possibly talk to a driver. Another way to get a taxi is to book one in advance. 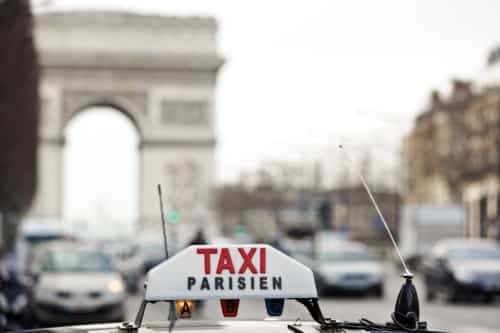 Many companies (les taxis parisiens, les taxis G7) offer online booking, or booking over the phone. They even have smartphone applications, and their operators usually speak English (or you can ask to be transferred to someone who does). The starting charge is 2.30 Euros, then it’s between 0.92 Euros and 1.42 Euros per minute. But beware of hidden charges: 1 Euro extra per piece of luggage or bulky items (like a stroller, but no charge for wheelchair), 3 Euros for the 4th passenger… and a minimum fare of 6.20 Euros. But mostly, you should be aware of the “waiting” charge, especially when you call in a cab: the driver is allowed to turn on the meter when he leaves to meet you, so expect a few extra Euros on the meter when the taxi arrives. 6 – What About a Child Car Seat in Paris? You’d better bring your own! If you book your taxi in advance, you may ask for a car seat; some companies provide one. But although it’s the law in France that babies/ children must ride in an appropriate car seat, taxis usually don’t have seats in their trunks, and they won’t care that you are traveling with your child on your lap. 7 – Are Pets Allowed in Taxi in Paris? Usually, it’s not a problem for small dogs. Allowing a bigger dog is at the driver’s discretion. They will tell you they charge the same as a regular taxi, but it is not true. They charge more, and it is not legal. It is not compulsory, but sort of expected. It’s customary in France to tip your taxi driver. I usually leave one euro when the drive is about 10 Euros, and 2 or 3 Euros when it’s around 50 Euros. But if you feel you had a helpful/ courteous driver, larger tips are always appreciated! Vous êtes libre ? Are you available ? 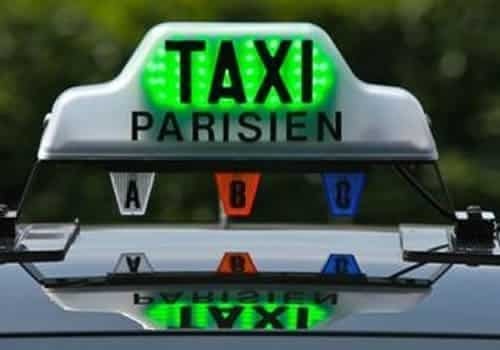 Où se trouve la station de taxi la plus proche ? Where is the closest taxi station? Est-ce que vous pouvez m’appeler un taxi ? Could you call me a cab? Je voudrais réserver un taxi pour demain à 15h – I’d like to book a taxi for tomorrow, 3PM. Combien va coûter la course ? How much is the ride going to be? Est-ce qu’il y a des embouteillages ? Are there traffic-jams ? Qu’est-ce qui se passe ? What is going on ? Dêpéchez-vous ! Hurry up ! Est-ce que vous avez un siège-auto ? Do you have a car seat? Est-ce que vous autorisez les petits chiens ? Do you allow small dogs? Est-ce que vous avez une voiture pour les chaises-roulantes – Do you have a car for wheelchairs ? Vous prenez les cartes de crédit ? Do you accept credit cards ? Je voudrais un reçu s’il vous plaît – I’d like a receipt please. Voilà Monsieur/Madame. Gardez la monnaie. – Here you go Sir / Madam. Keep the change.